LOS ANGELES — The glee club members twirl their wheelchairs to the tune of "Proud Mary" and in joyful solidarity with Artie, the fellow performer who must use his chair even when the music stops. 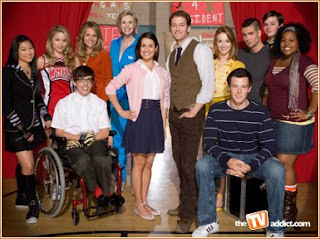 The scene in Wednesday's episode of the hit Fox series "Glee," which regularly celebrates diversity and the underdog, is yet another uplifting moment — except to those in the entertainment industry with disabilities and their advocates. For them, the casting of a non-disabled actor to play the paraplegic high school student is another blown chance to hire a performer who truly fits the role. All of that is nonsense, said Hall: "I've made my living as an actor for 30 years and I walk on two artificial legs." Hall, 61, chair of a multi-union committee for performers with disabilities, is part of a small band of such steadily working actors on TV that includes Daryl "Chill" Mitchell, star of Fox's "Brothers"; teenager RJ Mitte of AMC's "Breaking Bad"; and ABC's "Private Practice" newcomer Michael Patrick Thornton. Veteran actress Geri Jewell, who has cerebral palsy, appeared on HBO's now-departed "Deadwood." Mitchell, 44, whose credits included "Veronica's Closet" and the film "Galaxy Quest" before he was injured in a motorcycle accident and "Ed" after he began using a wheelchair, is also a producer on the Sunday sitcom that's in need of higher ratings if it is to survive. For Mitchell, "Brothers" represents more than just another show: He calls it "a movement" that deserves support from the wider disabled community as well as the industry. "This is what my life is. This is what I want the world to see," he said. "I want to hold the networks accountable. If I can come out and do what I'm doing, they can come to the table."